Warren’s Lobster House is a New England Tradition and is Nationally Famous! Warren’s has been providing excellent food and service since 1940! 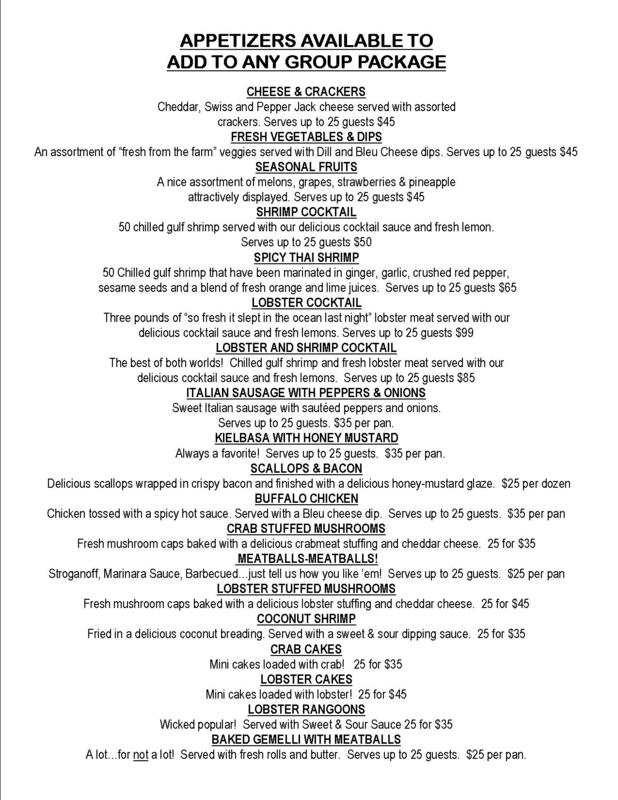 Come and enjoy New England Lobster, Seafood and other Specialties. 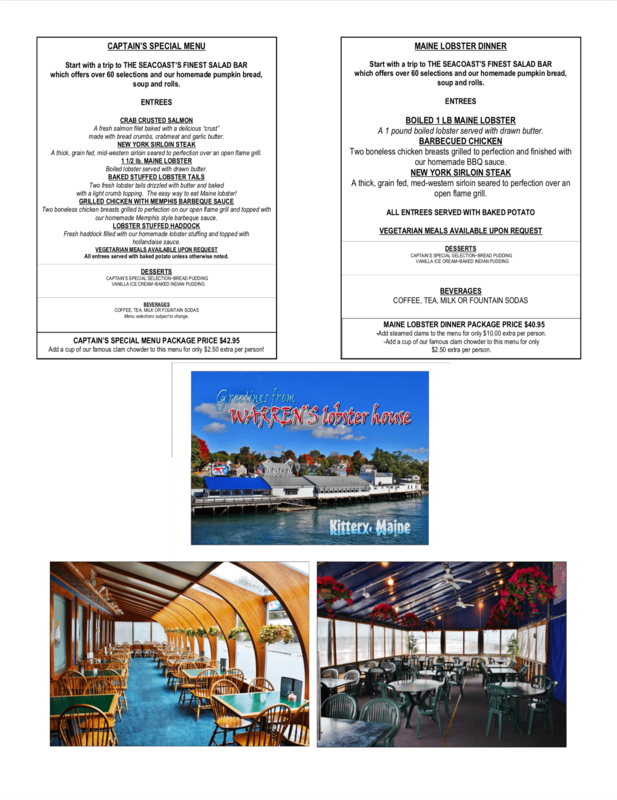 In addition to our regular menu, we feature lunch and dinner specials daily. 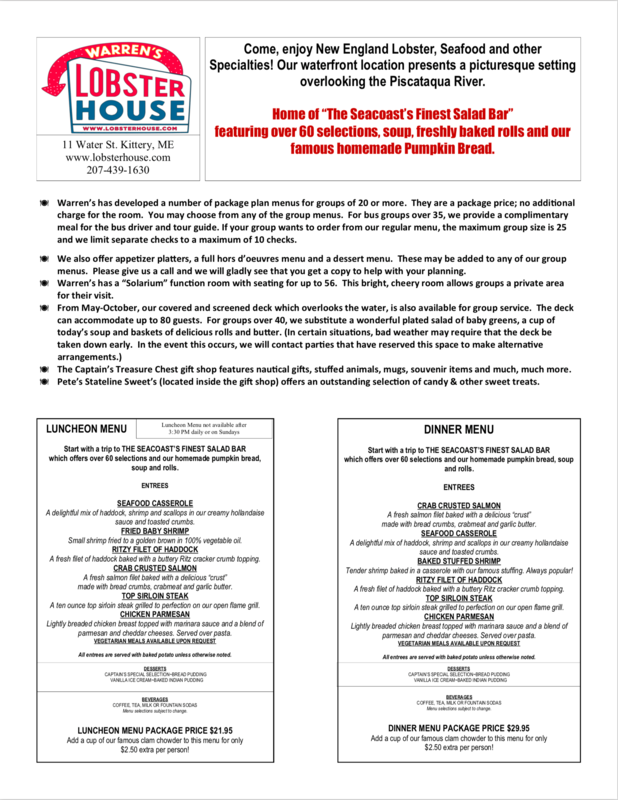 All lunch and dinner entrees include “The Seacoast’s Finest Salad Bar” with over 60 selections, soup, fresh rolls and our famous homemade pumpkin bread. Our waterfront location presents a picturesque setting overlooking the Piscataqua River. Warren’s has developed a number of package plan menus for groups of 20 or more. They are a package price; no additional charge for the room. You may choose from any of the enclosed menus or we would be happy to prepare a menu to fit the specific needs of your group. For bus groups over 35, we provide a complimentary meal for the bus driver and tour guide. If your group wants to order from our regular menu, the maximum group size is 25 and we limit separate checks to a maximum of 10 checks. We also offer appetizer platters, a full hors d’oeuvres menu and a dessert menu. These may be added to any of our group menus. Please give us a call and we will gladly see that you get a copy to help with your planning. Warren’s Solarium function room has seating for up to 56. This bright, cheery room allows groups a private area for their visit. The Captain’s Treasure Chest gift shop features nautical gifts, stuffed animals, mugs, a Christmas corner and much, much more. Browsing is a must! Our Gift Shop and Candy store are open year round unless bad weather causes closure-which happens occasionally. The enclosed material will help you plan your visit. Please note that Warren’s is easy to reach from Interstate 95. We are only one mile south of the famous Kittery Outlet Malls and have excellent bus access and parking. If we can assist you in any way, please call 207-439-2058 or 207-439-1630. Refund Policy All payments are final and no refunds will be processed. Shipping Policy All items will ship within 2 business day of the order being placed.